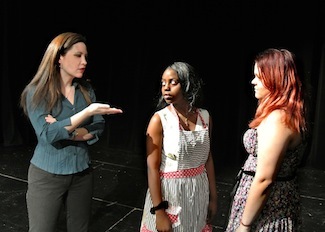 Course introduces students to the basic techniques and theories of acting. Benefit performance at culmination of semester consisting of scenes and monologues provides students with the opportunity to apply performance skills. Scene and character analysis emphasized. Basic audition technique also taught. St. Francis College. Course explores the evolution and social significance of Modern Drama. The class reads and discusses playwrights of the late 19th Century such as Henrik Ibsen, through contemporary playwrights like Eve Ensler who continue to develop groundbreaking and socially significant works today. LIM College. Private Acting & Public Speaking Coach since 1996. Course teaches the practice of extemporaneous speaking. Students receive an analysis and correction of individual speech problems. St. Francis College, LIM College, and Queensborough Community College. An intermediate course aimed at public presentation and speech performance, selects prose, poetry and plays to analyze for delivery. The objective of the course is to broaden communication skills by teaching students to comprehend and interpret forms of literature for purposes of effectively communicating them in oral presentations. St. Francis College. First Year Experience Seminar is designed to introduce students to the numerous departments and resources offered at LIM College and to ease their transition from high school to college life. Students will strengthen their study skills, note-taking skills, and time management skills. In addition, topics such as financial management, diversity, and nutrition will be discussed. First Year Experience Seminar seeks to help freshmen embrace responsibility for their lives and make informed decisions about their futures. LIM College. Course designed to help further develop skills in writing, reading, research, and critical thinking. Emphasizes narrowing a topic, constructing a thesis, organizing an essay, developing an argument, writing analytical responses to readings, and effectively utilizing APA documentation. LIM College. Course helps students become better life long researchers and writers. A key focus of the course is developing student information literacy, which entails using search terms, search engines, print sources and databases to gather compelling, valid, and scholarly research--as defined by the American Council of Research Libraries. LIM College. Students learn the craft of stillness & listening, focusing on the “other”, and how to adjust for the lens. They learn how to relax and breathe for the camera as well as how to self-evaluate after viewing their work. Playwrights Theatre. Course designed for actors that want to develop their character building skills. Course includes in-depth work on a contemporary scene and exercises in creating character. The N.Y. Acting Company. Course designed for beginning actors to teach the fundamentals of acting. Course includes two contemporary scenes, one monologue, text analysis, and the fundamentals of building a character. The N.Y. Acting Company. Course focuses on the importance of breath, playing the objective, listening, given circumstances, and being in the moment. Students work in-depth on two contemporary scenes. The N.Y. Acting Company. Course designed for actors to work in-depth on monologues and cold reading audition technique. Course focuses on the following elements: the importance of breath; being in the moment; imaging the other; the passionate pursuit of an objective and playing actions to achieve that objective; the pre-beat; the fundamentals of building a character; and making quick, bold choices and applying them to the work. The N.Y. Acting Company. Course designed for young adults to develop their performance skills. Playwrights Theatre. Teaching Artist Residency, 3rd through 6th grade. The purpose of this residency was to introduce Spanish speaking students to acting and improve English skills through improv and acting exercises. PS-246. 7th grade students learn the basics of playwriting and complete a one-act play. Benjamin Franklin Middle School. Performance Artist guest teacher for the National Endowment for the Arts and the Poetry Foundation’s Poetry Out Loud program. Course focusing on performance aspects of poetry performance. Multiple schools. Teaching Artist Residency for a drug rehabilitation home for young adult males. The purpose of this residency was to bolster self-esteem through writing exercises, improv, and acting games. Culminated in performance of self-written monologues as well as scenes and monologues of established playwrights that particularly challenged each student. Renaissance House. Summer program for children ages eight to sixteen. Through improv, scene work, and acting exercises, students explore the craft of acting. The Institute of Music for Children. Madison Young Playwrights Program. Students learn the basics of playwriting and complete a one-act play. Kings Road School & St. Vincent Martyr. Course designed for children in 4th through 6th grade and 7th through 9th grade to develop their performance skills. Through improv, Laban, and acting exercises, students explore the craft of acting and create specific characters for final performance. Playwrights Theatre. Teaching Artist Residency through Artsgenesis. Native Americans in Queens Tapestry with Acting and Movement. Through improv, chanting, song, and dance, taught blind and visually impaired children, kindergarten through third grade. PS-254. 1st through 3rd graders learn the art of creative play and fundamental playwriting skills. Class culminates in performance of self-written scenes. Playwrights Theatre. Teaching Artist Residency. Taught Acting to 7th graders. Because many of the students had behavioral issues, course focused on the importance of listening and playing actions. Scene work, acting exercises, and improvisational games were used to teach these skills. Madison Junior School. Teaching Artist Residency. Taught Acting to 8th graders. The course focused on the importance of taking risks as an artist. Freewriting exercises were used to write autobiographical monologues and were later performed for the class. Also, improvisational games, acting exercises, monologue and scene work were an integral part of this class structure. Madison Junior School. Teaching Artist Residency, the purpose of this residency was to give acting and playwrighting coaching to the Drama Club students. Victory High School. Course designed for children in 4th through 6th grade to develop their performance skills. Class culminates in a performance. Playwrights Theatre. Volunteered and taught Acting to teenage girls. Workshop designed to build self-confidence and promote active listening in the moment. Bay Area Girls Center. Through Artsgenesis, training teachers to use acting exercises and improv to enhance curriculum. Roselle Center in New Jersey. For children and teenagers. The San Francisco Shakespeare Festival. Directed the following plays at St. Francis College in Brooklyn Heights, New York: Check Please, Angels in America: Part 1Millenium Approaches, Tartuffe, Polaroid Stories, Plaza Suite, Life, Love & Burnt Dinners, Other Entanglements & Months on End. Directed (and wrote) the film Strength Training Video for Turtle Shell Health, New York, New York. Directed 29 Questions & My Favorite Felon at The Shell Theater, New York, New York. Directed Reconstructing Julie at The Algonquin Theatre in New York City. Directed Blood Astounds Me at NY Artists Unlimited in New York City. Co-directed national PSA voiceover for the Federal Highway Administration. Directed several Acting Showcases in New York City through the N.Y. Acting Company. Directed various performances at Playwrights Theatre for their conservatory. Directed teens in production of A Midsummer’s Night Dream at the San Francisco Shakespeare Festival. Directed own adaptation of Borderlands: La Frontera for Women’s Ensemble Theater in Santa Cruz, California. Directed Friends of the Family, a new play in development for a Play Development Workshop in Santa Cruz, California. I guide students through the fears that many students have when taking a public speaking class. I teach them to harness their nervousness and use it to their advantage. I teach relaxation and articulation exercises so that they can have their voice and body in the best possible condition. My theater background allows me to utilize teaching techniques to elicit active, passionate and effective speeches from my students. Whether it is a regional accent or a severely shy personality, I challenge my students to push their own boundaries and limitations. My students make great strides in their speech giving skills and I take pride in that. I am nurturing, and yet extremely challenging, and that contributes to the great success of my students. Acting is about the human experience so the potential for growth is infinite and that excites me. It is the task of the actor to tell the play's story--to propel the forward action of the play. I give the actor the tools and skills they need to accomplish this task. I create a nurturing, non-competitive environment for actors to work on their craft; this supportive atmosphere allows one to take risks and grow as an artist. I teach my students the importance of breath and to trust their bodies. I believe in unleashing impulses, getting out of one's head, specificity, staying open and present to the moment, and the ability to respond spontaneously to what your partner is giving you. However, I also believe the emotional journey must be coupled with a solid intellectual technique including script analysis and understanding the relationships and given circumstances of a play; I teach actors to examine the text and make informed choices. I teach warm-up exercises to bring the actor into a state of being where their instrument can experience maximum creativity, imagination, and relaxation. Once the student is open and breathing freely, we explore character work and its accompanying adjustments. Working through fear and inhibitions can be the most empowering part of being an actor. At the core of my work is the belief in empowering actors, in exposing them to many methodologies and in encouraging them to discover and create their own, unique, customized method of acting. Fundamentals of Speech, Poetry Out Loud, Interpersonal Communication, Introduction to Acting, Character Development, Acting for the Camera, Meisner Scene Study, Performance Lab, Intermediate Scene Study, Advanced Scene Study, Introduction to Acting Shakespeare, Monologue & Cold Reading Intensive, Imaginative Movement, Women's Words (Scene Study of Contemporary Women Playwrights), Latino Playwrights Scene Study, Performance Workshop, Acting for Dancers, Personal Monologue Development, Public Speaking, Directing 101, Audition Fundamentals, Shakespeare Scene Study, Art of Improv, Play Development Workshop, Playwrighting, Research & Analysis, & Modern Drama. Judith Shakespeare Company, winner OOBR award 1996 is a not-for-profit theatre ensemble dedicated to discovering what lies at the heart of a great play through the exploration of its language; and to re-examining the roles for women in classical theatre. Company Member. Visible Theater Company creates playing fields where artists express their authentic voice through process and performance, with the belief that cultivating presence and celebrating our deepest humanity will empower and transform us all. Company Member. Take Wing and Soar, where classically trained actors of color take center stage in hilarious and dramatic performance pieces staged for New York's diverse population. Company Member. National Association of Professional Women. Member. Certified CPR/AED instructor at Emergency Skills Inc.
Standardized patient for medical school undergraduate students. Simulation trainer at Weill Cornell Medical. Participated in Planet Connection’s Theatre Festivity, New York City's premiere eco-friendly theatre festival, connecting artists and audiences with diverse dynamic charitable organizations.